Nysse stared at Rhese evenly as she handed Mirrase to him once he’d finished speaking. She picked up Rhylian and settled him to his mid-day meal. 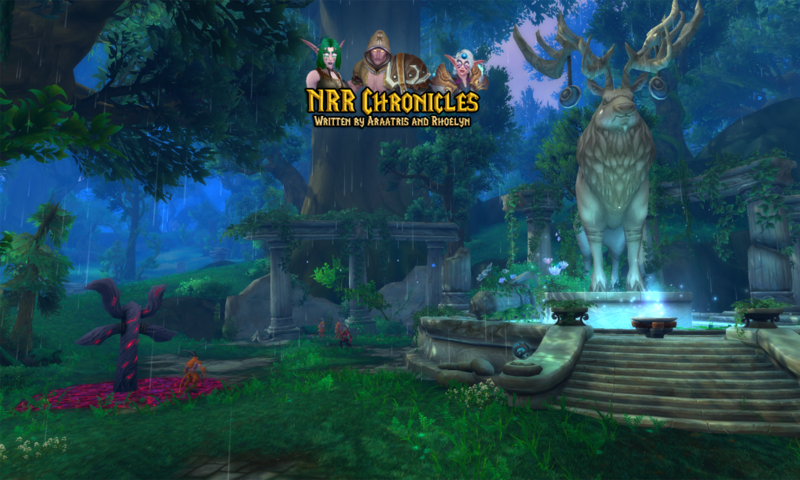 “Rhoe is in Darnassus. Are you planning to head there after Darkshore?” Her expression and tone were carefully neutral, unwilling to upset the children. Her mate watched her carefully, tucking their daughter into the crook of one arm. He could sense her rigid control, and he internally winced at what he knew it meant. Rhese couldn’t suppress the shudder that shook through him at the thought, but he made an excuse to turn his back to her and take a few steps away, bouncing Mirrase, rather than let her see how the blood drained from his face. He nodded, brushing a hand through his hair. Mirrase squeaked and reached up for his face, so when the motion ended, he set his finger in her questing little fist. “Will they stay with you, Nysse? You’re going to need more help than Yami can give while I’m away. Cenarius’ Beard. What do we do to make him stay if he wants to come along?” Rhese paced to the far side of the room and back, his agitation palpable. “Rhese, we will figure this out. First things first, we’ll need the bag for their stuff. Then we’ll go see my parents and settle the twins, then see Yami, then we’ll head to Darkshore.” Nysse stated their plan as if there had been no doubt what they’d do. As ordered, the young man stilled himself and took a deep breath, leaning down to nuzzle his daughter’s soft cheek as much for his own comfort as hers. She expressed her appreciation by filling her fists with his silver hair, distracting him with the task of extricating it. Stricken, the huntress’ mate stilled and stared at her for a long moment before he looked at the boy against her shoulder, his silken little head wobbling around unsteadily as he pondered the view. His big hands cuddled Rhy’s twin closer, gentle but needy and troubled. “Nysse, love…” he started, but he stopped himself, sighing, and turned away to walk to the window and peer out. Silence blanketed the room like the snow did the rolling hills of Winterspring outside. “I know you always want to protect me. Especially, now that the twins are with us, but I could never forgive myself if I lost you and Rhoe to war and did nothing.” Nysse ducked her head, letting her long hair hide her face as she paced with Rhylian. Nysse raised watery eyes. “We’ll come home with Rhoe. We have to, Rhese.” She leaned her cheek toward his hand. “I’ll ask my parents and Yami to take the twins somewhere safe. Stormwind? We can follow once things settle down. Do we need to tell Morthis? I know he’s going to fuss.” Her soft rambling voice finally betrayed her own nervousness. Her mate sighed and lifted his hand to her cheek, his thumb brushing gently over her soft skin before he leaned forward around the two children they held and kissed her gently. He rested his forehead against hers for a moment before he straightened and spoke, his voice subdued. The druid didn’t finish the thought, for which both of them were glad. He just rubbed Rhy’s silky skin for a moment before moving that hand down to Mirrase’s chubby, rosy little cheek. She gurgled at him as her fingers worried at his thumb. She blushed as she laid Rhylian down, keeping a casual tone. “I was surprised that it fit. I was a little worried about that after having the twins. It’s been longer than I like since I’ve practiced, and I still haven’t lost the last little bit of baby weight…” The huntress sighed, deftly slipping the neck of her shirt from the babe’s grasp. “I’m not too worried about tha-oh! I’ll have to make sure to arrange travel for Tsume. I hope she doesn’t mind going by air again. Or should I leave her here? I’d hate to leave her, but we’d make faster time.” She continued to chatter as if not really expecting a response, but needing to hear her own voice. With Mirrase laid carefully in her crib, wiggling and cooing contentedly, the druid turned to his chattering mate and held out his arms for their son, grinning with soft amusement as she handed him over without breaking stride in her monologue. When the boy was laid beside his sister, equally content and twice as sleepy as his twin, he stepped up behind Nysse and wrapped his arms around her waist. “Oh, Rhese… I’m terrified, but I can’t leave you. I need to stay by your side.” Her sniffle was muffled against his shoulder. “And I’m sure Rhoe wouldn’t want to leave either…” She slid her arms around him, her hands clinging to his back. She raised on her toes to give him a tender kiss before she stepped back and hurried to the bag, gathering what the twins would need. The twins rested obliviously nearby as their father passed by.